Reader confusion is a common problem with first drafts. Prose is ambiguous, and scene details leave conflicting ideas of the time line or the physical location of the characters. The problem of ambiguous prose lies in the writing itself. Let’s look at some common problems and how to solve them. Fuzzy thinking. OK, you were knocking off a draft of a chapter at midnight and, well, you got fuzzy in your thinking. It happens. But you can’t leave prose that is garbled. As you read through your draft, mark places where your sentence structure got complex in an effort to explain something. To revise, first get the thought straight in your own head. Then, write it in simple sentences because it will force you to clarify your thoughts. Then, if appropriate for your audience, combine those sentences into a prose that flows better. Technical explanations. When I have technical explanations — in my WIP, I have to explain a complicated process to defeat a black hole — I often find a new or naive reader. I want to know where they got confused or what they still had questions about. Then I’ll rewrite and repeat until the naive reader understands. Try to make even technical explanations simple enough for a child to understand. Pronoun Antecedent. A good command of language means that sometimes you use pronouns to avoid repeating a noun over and over. But too often, it’s not clear who/what the pronoun is referring to. The rule is that a pronoun refers back to the noun closest to it. When Jack and Bob decided to eat out, he decided they should go to a Mexican restaurant. Who decided? Jack or Bob? The noun immediately before “he” is Bob. When there are multiple people involved, it’s usually best to repeat the person’s name. When Jack and Bob decided to eat out, Bob decided they should go to a Mexican restaurant. This one is a pet peeve of mine, and I’m always aggravated when the pronoun’s antecedent is confusing. If repeated often, it can make me close the book and move on to something else. Word Choices. When I was teaching Freshman Composition, I laughed at the confusion created in an essay by the use of the wrong homophone word. Homophones are words that sound alike, but are spelled differently. They are confusing to poor spellers! And spell-check won’t catch these errors because the alternate spelling is a correct word. Here’s the poor freshman’s sentence; he’s talking about cheerleaders at a basketball game. With her enthusiasm and loud cheering, she was the hart of the team. Of course, he meant “heart.” But I still have visions of a deer with big antlers cheering for a slam dunk. If you’re one of those poor spellers, you MUST have someone else read through your story before sending it out. Spell-check alone isn’t enough for you. It’s confusing because I didn’t see any reason for that character to be yelling. The author obviously wants to signal that the character speaking is upset. But merely “yelling” doesn’t do that. Instead, I’m confused about why this character is acting so weird. Be careful that your choices accurately reflect the emotional state of your character. You can’t have any unearned emotional moments. If there is truly a reason to yell, take the time to explain the reasons. Another confusing story element is the setting, which includes both time and physical location. Where? Stories are grounded in a particular place. When a story presents a talking head, it fails to take advantage of the full range of storytelling techniques. The place or setting of a story should be revealed in enough detail to make it come alive, without intruding on the story line or pacing. Most people err on the side of too little detail, whether worrying about dragging down the story with “unnecessary description” or a failure to imagine the scene in enough detail. That’s akin to a bare stage and a solo performer. That works. But not in a novel. Time. The story’s descriptions should locate the story in a particular historical period or a specific year, a season of the year or a specific day/month, a rough time of day or a specific minute/hour. A friend once wrote a story that was set in December in the U.S., but lacked any Christmas decorations. It didn’t take much, but the bits added were essential to ground the story as a December story. Map of Scene. It may also be necessary for you to draw a map of where a scene takes place, whether that’s a single room or a neighborhood or a city. It’s helpful to put a finger on the map and tell the story as you move your finger from place to place. Let’s say you wanted to write a fight scene in a living room. You start by describing the child’s rocking horse in the middle of the rug. But when the two men start to fight, they never trip over that rocking horse. The exact details should be clear in your mind as you describe characters moving across the scenery. If they aren’t, go back and get your map straight. You’ve likely heard the advice not to use adverbs. Here’s a big exception. Time words help ground the scene and create the narrative sequencing of details. 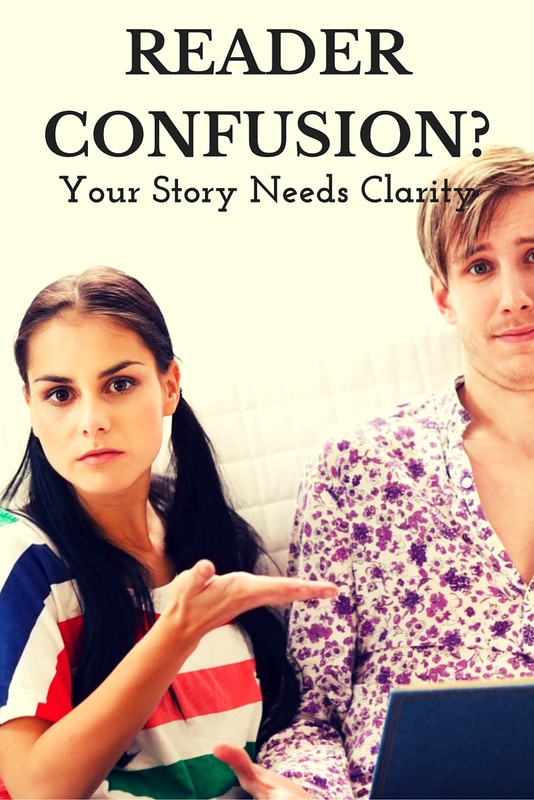 Don’t leave your reader confused about the “When” of the story. As you work through your draft, clear up all confusions possible, especially prose and scene details. Otherwise, your reader may not stay with you!